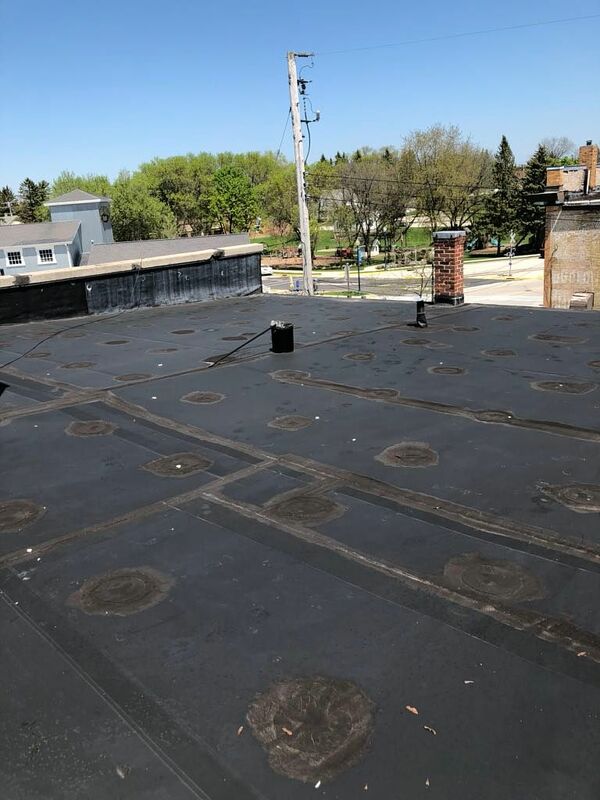 The project started as a lead from Home Advisor for an inspection on a rubber roof. 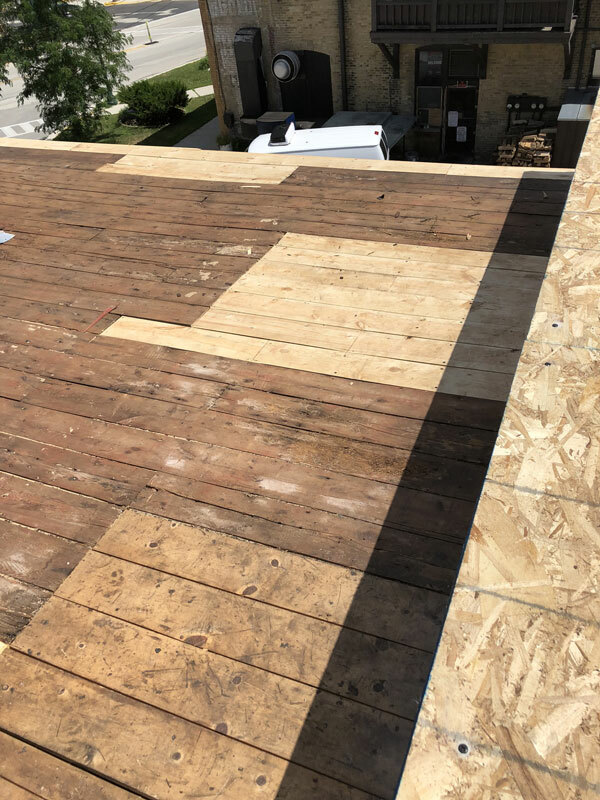 I met with the owner, Hugh Lomas, to go over his residential roofing project. 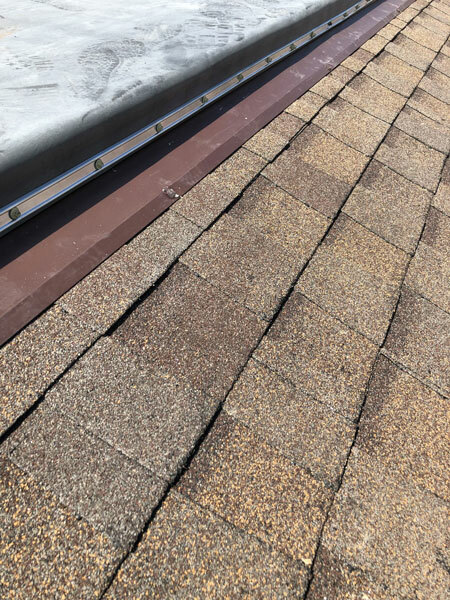 After completing an inspection with the property owner; I explained to him the issues that he was having with his roof due to the age and installation techniques used. I also explained to him that aside from the depreciated roof he had a second problem with water drainage. Water was being trapped between his building and his neighbor’s building due to poor drainage. After doing a complete inspection with Hugh, I created a written proposal detailing his problems and how we would correct them. 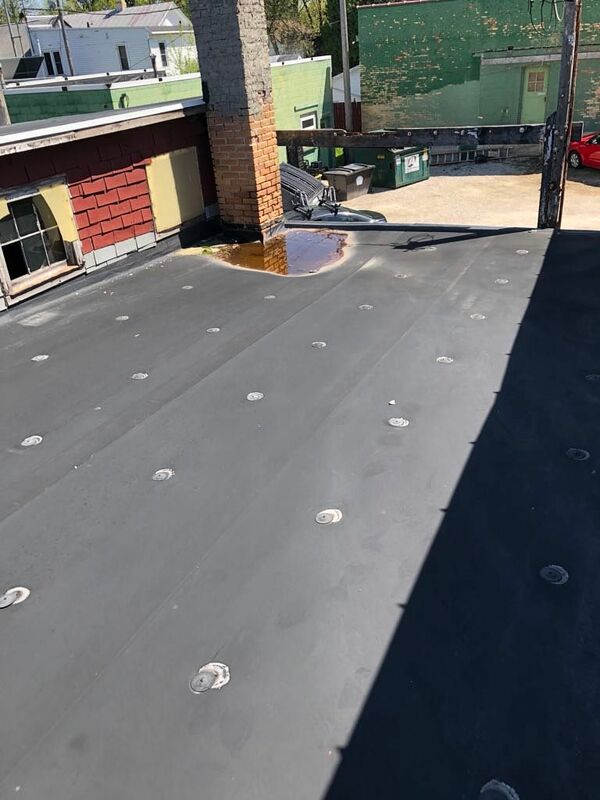 I addressed the six different roofing surfaces and how we would divert the water off of his building. I designed a drain system that would tie into an existing internal drain and divert the water out from between the two buildings. This eliminated his issue where the water was trapped between the buildings. 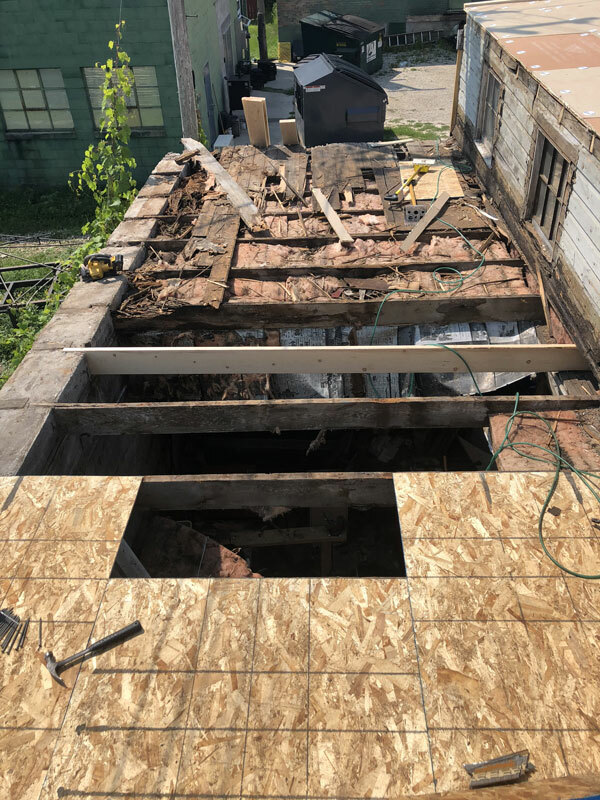 Working on the Solution – and Keeping the Neighbors Happy! 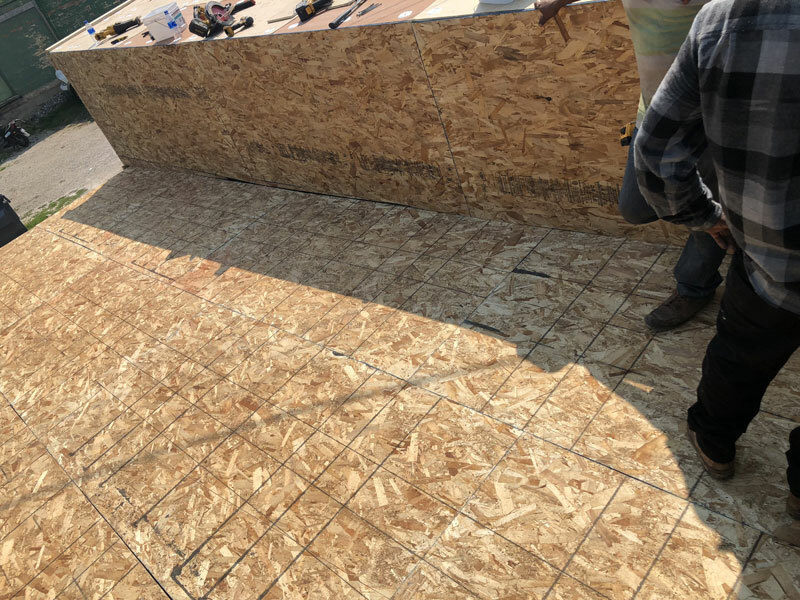 The first phase of the project was completed before a large race weekend known as “vintage weekend” started in Elkhart Lake. 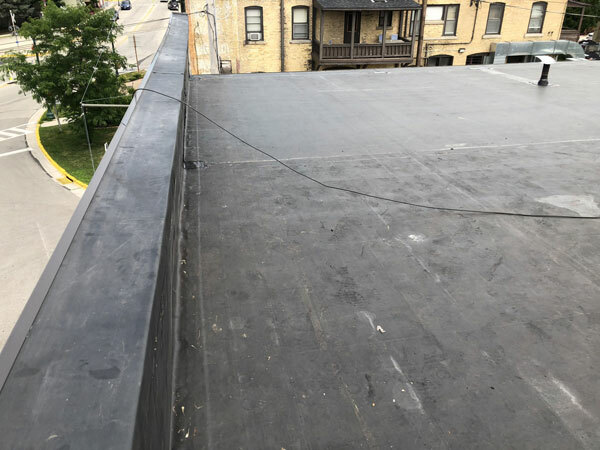 This project included doing a flat roof two and a half stories off the ground. 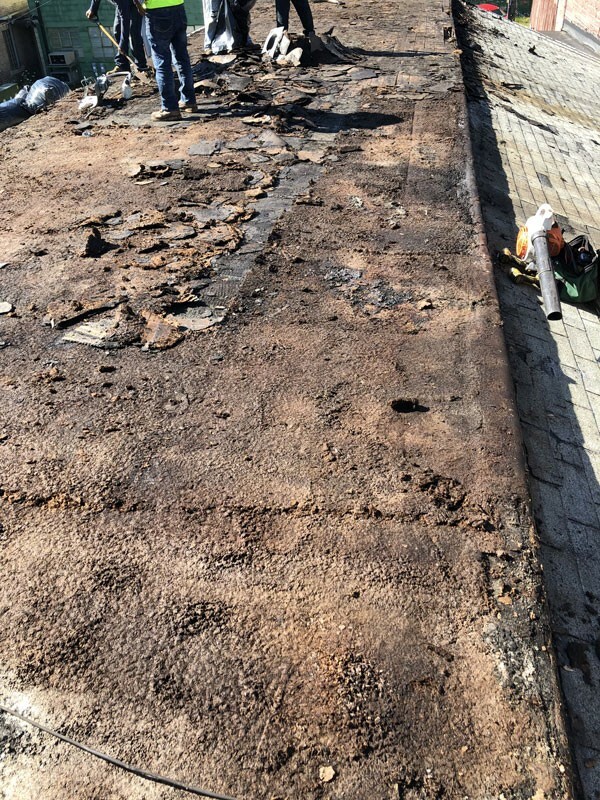 A second rubber roof where tapered insulation was used; this helped to divert the water off the roof. 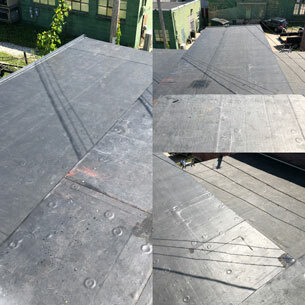 We also added two shingle portions that tied into a rubber roof. 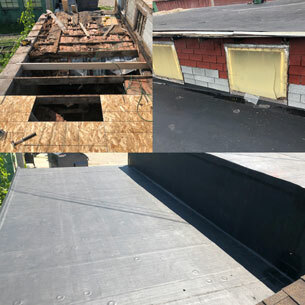 During this phase, the gutters and drain system was also completed. This part of the project took about four days, keeping us on schedule. 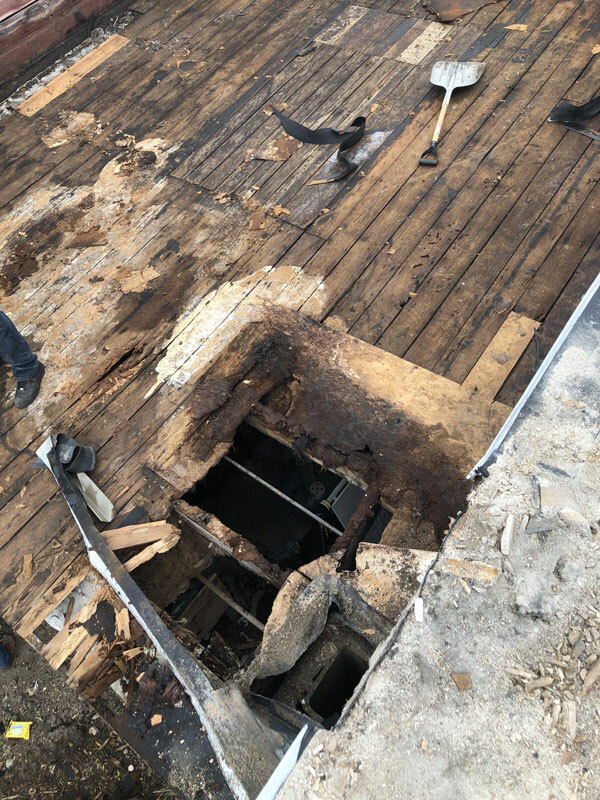 All existing penetrations not used, including a chimney, were discussed with the property owner and removed. 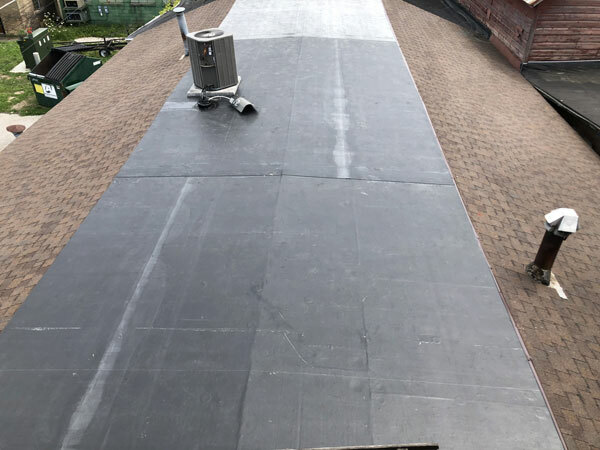 We scheduled to complete the second phase of the project later in the month to accommodate the surrounding property owners for the busy upcoming weekend. 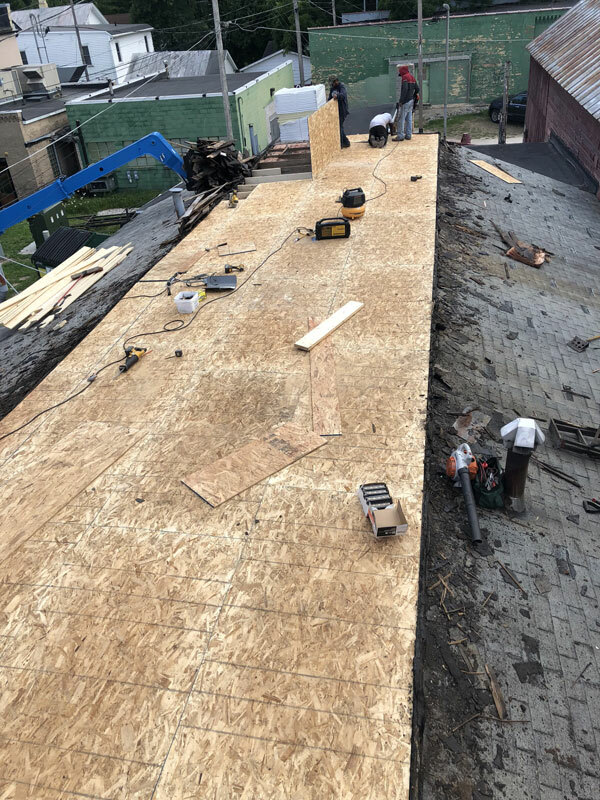 During this phase of the project, a telehandler was utilized to unload debris from the rooftop and keep a clean job site. 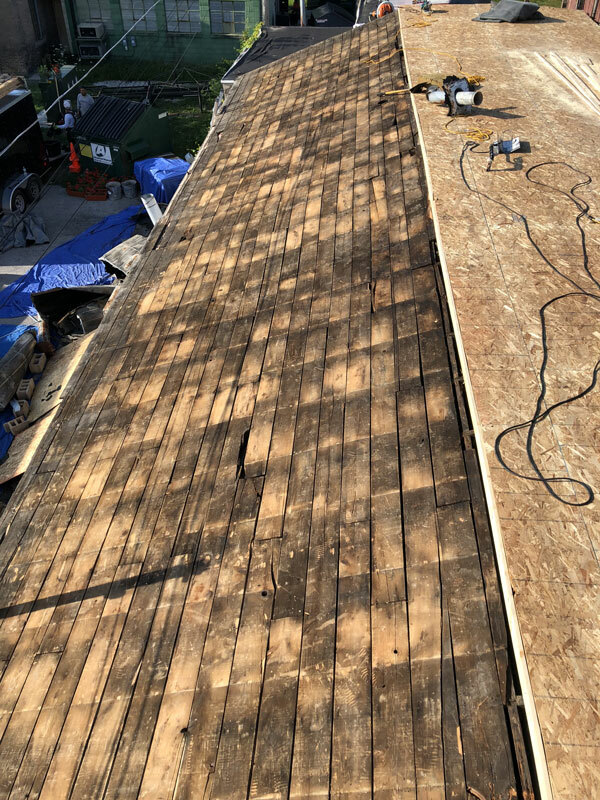 While working on this portion of the roof we had to completely replace the subroof on portions of the property due to extreme water damage. The second part of the project took 3 days. 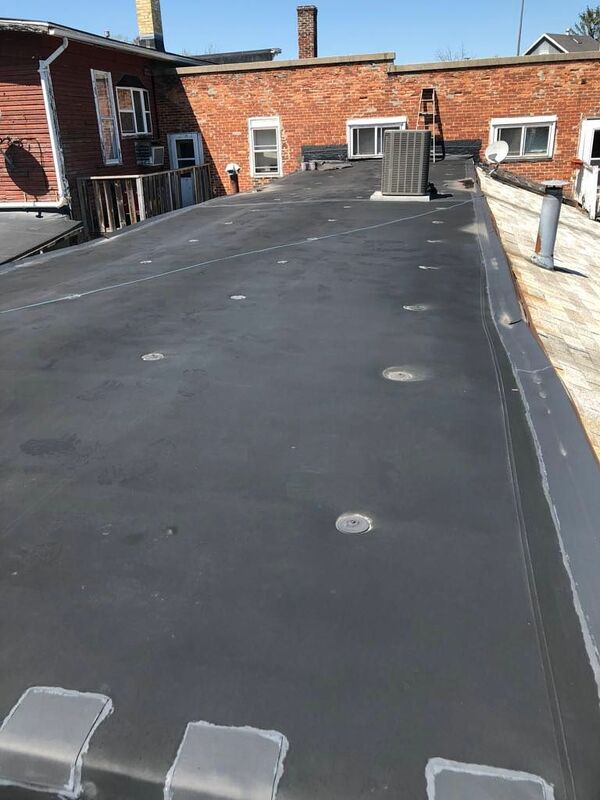 This part of the project included full replacement on the sub-roof and also replacement/ repairs on 2×6 stringers which were a result of previous water damage. 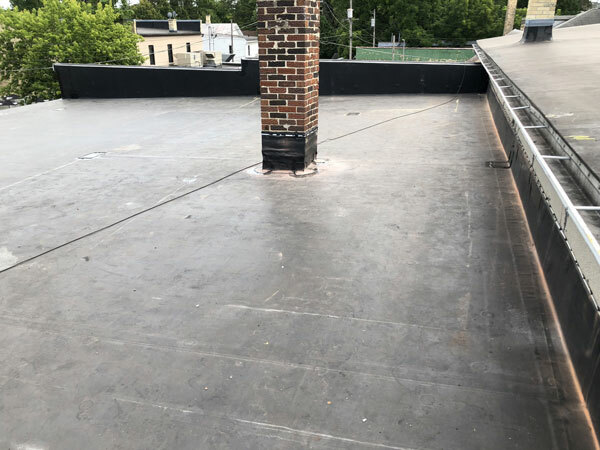 An existing chimney was removed to eliminate a penetration in this roof. 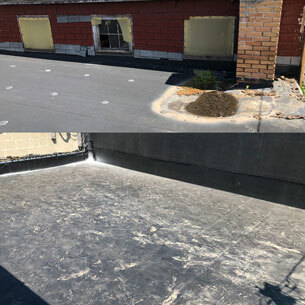 We also completed new gutters on this portion of the roof to contain and divert water properly. 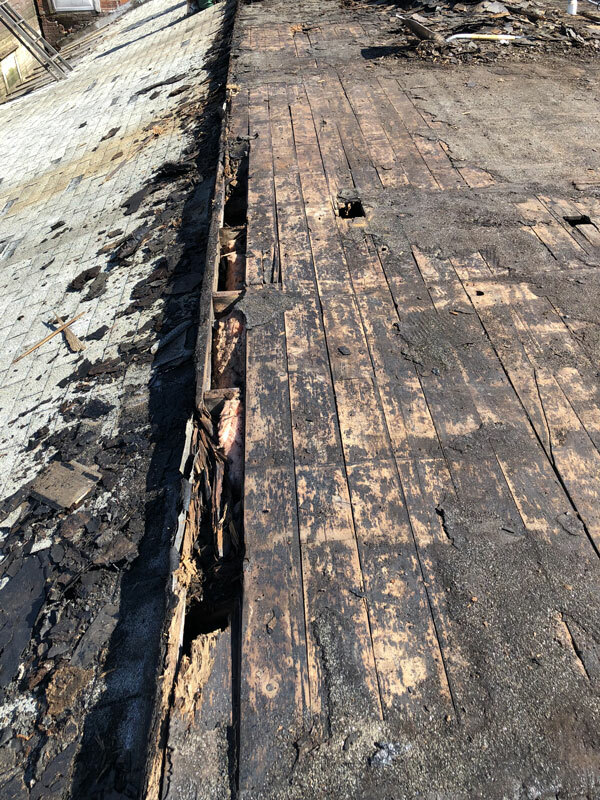 This project was an example of why preventive maintenance on a low slope roof is important. 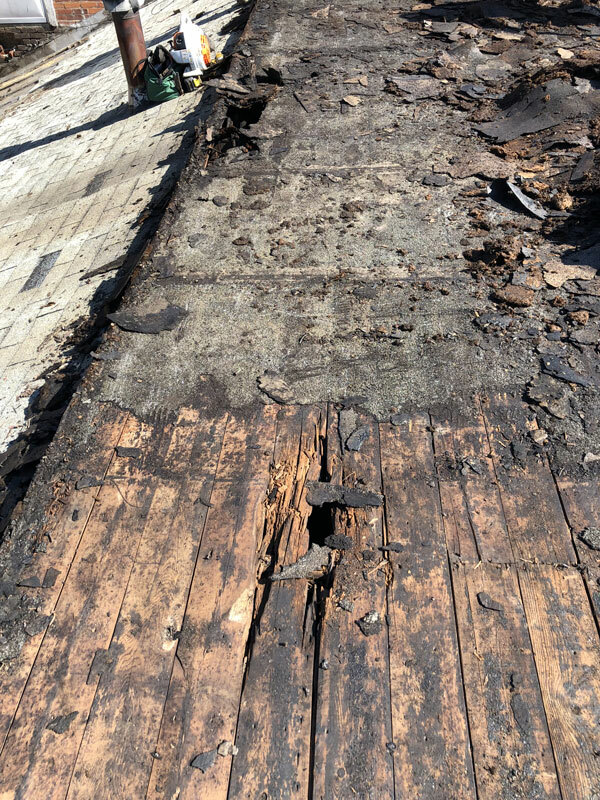 It also was an example of why you should hire a trained/licensed professional to install your roof to ensure proper installation techniques are used. After completion of this project, we were referred to some people by the tenants that lived upstairs in the building. The tenants also thanked us for our cleanliness and efficiency on the project.